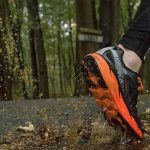 The Hoka One One Mafate Speed claimed to be a bombproof trail shoe sporting maximal cushioning, 4mm off set, and huge 30+mm stack heights, while also reducing weight. Compared to the Pearl Izumi Trail N1, the Mafate proved more expensive with similar weight and geometry. The Hoka One One Mafate Speed stayed stable on linear terrain but did not bode well on technical trails. 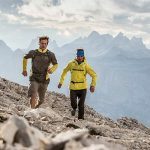 This shoe is best suited for mid to ultra trail running on primary non-technical straightforward trails. Hoka One One’s hallmark Mafate Speed was reintroduced in true form with maximal cushioning. The metarocker geometry that carried forward from previous models lent an efficient ride with good speed despite moderate weight. Unfortunately the sole of the shoe did show early signs of wear over the forefoot rocker. Hi-abrasion rubber was present but only over the lateral heel (for you heel strikers) and otherwise only sparingly in 2 small strips over the forefoot. The upper and outer proved easy to clean with a hose and cloth. CMEVA upper mid sole provided the trademark Hoka cloud-like feel. The active foot frame allowed the foot to sink within the midsole and gave a comfortable feel. Where I felt comfortable walking, my forefoot was sloppy and there was too much lateral motion when running. The no-sew speed frame upper proved challenging to create a stable lock using the speed lacing system. This being said the forefoot real estate was rather narrow despite the shoe’s footprint and with longer runs forefoot splay was restricted. Total contact sole with spongy rubber ensured ample ground contact but this proved reliable only when running straight. Medial-lateral stability was poor at best with running on dewed grass and downhill mud, even with berms. Large stack heights and a super firm midsole elevated my ankle’s center of mass, which gave the feeling I was holding back. For this reason I was unstable on ground other than cross country trails. Despite a heavy weight this shoe had get up. Forefoot lugs secured ground contact ensuring fast uphill runs without backsplash. An insanely firm mid foot supported a quick turn over. I suspect, as with the whole Hoka line, it’s geometry had a lot to thank for this. Linear running was a blast yet agility proved sloppy due to poor fit. The early meta-rocker worked to counter the maximal cushioning. Hoka has nailed down the balance of cushioning to a responsive ride with a 4mm drop and it’s midsole material. There was a sensation of springiness on both levels and grades. An outsole of RMAT material was added under layers of EVA foam for added durability however high abrasion rubber was sparse. The central lugs showed signs of wear after 20 miles and could be made more robust. With a reduction in weight I felt the shoe’s durability took a hit. At $170 this is the apex of the Hoka One One line. Hoka One One’s 2014 road line was well received and captured a wider demographic of runner but the mafate speed will remain a niche product for select followers. For those running in earlier versions, this new model will be a sure catch. For the runner looking to break into a maximal or supportive trail shoe this is not the shoe to start with.